Western Digital's My Book Studio Edition II is an external hard drive that uses two drives, pre-configured as a fast RAID 0 (striped) array. Our test unit came with two 500GB WD Green Power drives (which use up to 30 percent less power than standard drives) striped as a 1TB volume. A version with two 1TB Green Power drives is also available. The My Book SE II ships formatted for the Mac, using HFS+ with journaling. If you want to share this drive with a PC, you'll need to reformat it to FAT32, a Windows-friendly format that the Mac can read and write. Also, if you want to boot from an Intel Mac, you'll need to go in and change the partition to use GUID Partition Map instead of the default Apple Partition Map that works with PowerPC-based Macs. 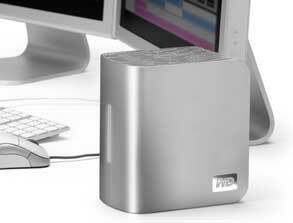 Western Digital's My Book Studio Edition II. If you don't want to use the My Book SE II as a RAID 0 array, you can't reformat the drives into two separate drives or a mirrored array using OS X's Disk Utility. You'll have to install the included WD Drive Manager software and use its tools. At comparable capacities, striped RAID arrays are faster than a single drive, since such an array uses two heads to read and write across both drives at the same time. The downside is that if one of the two drives fails, you lose all of your data. A mirrored array (RAID 1) offer greater protection against drive failure by maintaining one drive as an exact duplicate of the other. If one drive fails, all of your data in your RAID 1 array is safely backed up. You could even use mirrored RAID with Apple's Time Machine and maintain a clone of your backup. The downside to mirrored arrays is that they cut your available capacity in half. You can also format the drive so that the two physical drives just show up as two drives on your Mac desktop, an arrangement known as JBOD (just a bunch of disks). This format doesn't give you either the speed benefit of a striped array or the protection of a mirrored copy of all of your data. However, it does mean that you can use all of the capacity of both drives, and if one drive fails, you only lose the data on that drive. We tested and rated the My Book Studio Edition II in its default RAID 0 configuration. The My Book Studio Edition II is 6.75 inches tall and 4 inches wide, quite a bit bigger than most books. It features a long, thin, vertical, glowing activity bar with six lights that pulsate and move up and down or flash, based on whether the drive is busy, idle, or malfunctioning. This bar can also give you a visual representation of your remaining drive capacity. Each light represents about 17 percent of your storage capacity, so if three of them are lit, you've used about half of your storage space. In terms of speed, the My Book Studio Edition II definitely gets a boost from its RAID 0 configuration, beating out Western Digital's My Book Studio Edition ( ) in our low-memory Photoshop tests, as well as the eSATA file duplication tests. Copy tests for the two My Book drives yielded near-identical results. The My Book Studio Edition II is both fast and roomy. With its attractive design and the ability to run in either zippy striped or data-protecting mirrored RAID configurations, this drive is worth considering either for those looking to perform Time Machine backups or for those who need fast-performing extra storage.